The UBC Malcolm Knapp Research Forest has a thriving research community which includes professional researchers and students from several UBC faculties, from Simon Fraser University, from BC’s provincial government, and from the Canadian federal government. 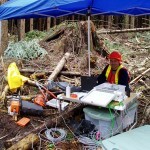 Researchers from other universities and from outside Canada also use the forest for research in their particular fields. Since the establishment of the Research Forest, over 900 research projects have been initiated on the landbase, and more than 100 of these are still active. Many of these active projects are longterm in nature, spanning close to 50 years and including some of the most extensive datasets in western North America. Research projects that are being carried out at the Research Forest encompass many different fields. While the majority of the projects focus on different aspects of forestry and forest management, several of the more recent projects touch on other, unrelated fields, such as astronomy and forensic entomology. The last 10 years has seen a shift in the focus of forestry research, from projects looking predominantly at maximizing growth and yield in managed forests, to projects which are more concerned with measuring impacts of different forest practices on the ecology of our forests. Studies of growth and yield continue, however, and these projects include some of the longest datasets we have. 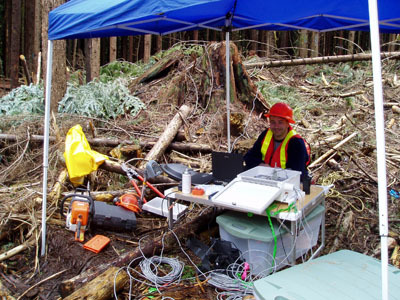 For a full list of research projects being pursued at the Research Forest, please check our Research Projects Database found at https://rpd.forestry.ubc.ca.